Whose Genius Hour Is It Anyway? This is a short post because I wanted to share a different kind of genius hour. 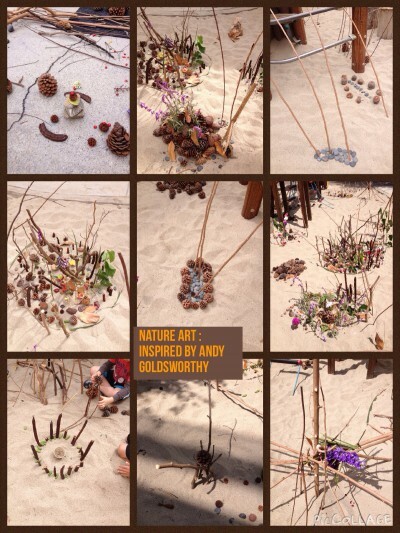 Last week was our Andy Goldsworthy Day on the EC2 yard. 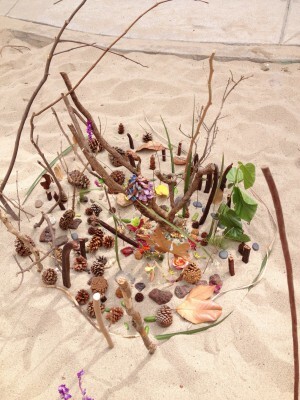 We had a whole day of using “stuff” from nature to create art. No pencils or writing instruments of any kind. It was time to collaborate, share materials and create what was appealing to the kinders. 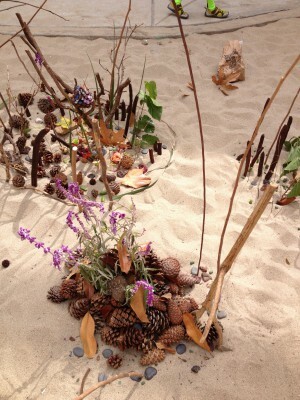 Over the years we have saved rocks, twigs, sticks, pine cones and tree bark. 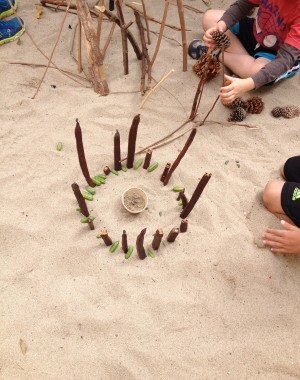 Each year the kinders collect natural materials that they bring in to share and we all use to make art. Some years we’ve made rivers and ponds. It really depends on the motivation and interest the kinders bring to this day. This year most worked in groups of four. Some sought out their best friends and some watched what others were doing and then joined in. It was wonderful to observe new dyads and triads find a common interest and work so well together. We picnic lunched on the yard and then went inside the early childhood classrooms for some quiet time and to listen to a few chapters in Charlotte’s Web (our first official chapter book – a kinder tradition). 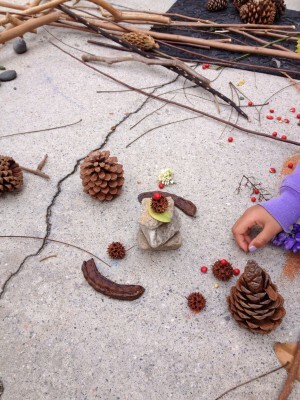 Then back outside for a chance to look at each others beautiful ephemeral nature art, before the kinders created other pieces with other friends. My kinders saw this as #geniushour a time. A time to come up with an idea, to make a plan, to try it out and work together. They problem solved when their structures needed support and they laughed with glee even when not successful! 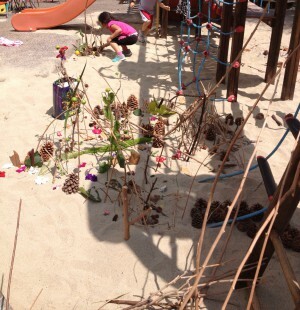 Most of the kinders were incredibly resourceful and worked cooperatively. Every once in awhile the temptation to use the longer twigs and sticks as swords was overwhelming, but these were short lived; creating art won out. And this being a shared space, it was time to disassemble their assemblages, sort and clean up the materials and store them for the next time. All in all a productive day, our #geniushour time thanks to Andy Goldsworthy’s inspiration. When the learning takes place outdoors a new dimension is added. Making time for these experiences a must, don’t you think? 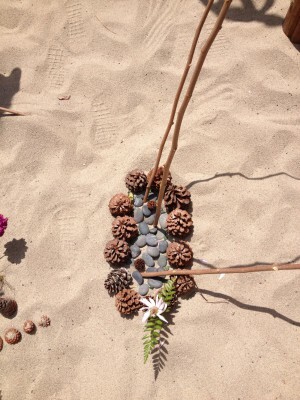 This entry was posted in #geniushour, #geniushour, #play, Uncategorized and tagged #geniushour, #outdoor art. Bookmark the permalink. 2 Responses to Whose Genius Hour Is It Anyway?